What Are the Causes of Seizures in Ducks? Seizures in a duck can be a symptom of several types of health problems. Only a veterinarian will be able to definitively diagnose and treat the cause of a duck’s seizures. Depending on the cause, the seizures may be a temporary or lifelong condition. Artificially incubating duck eggs is more complex than one might expect. 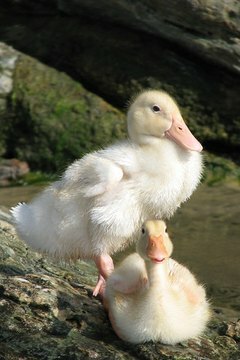 If the eggs are incubated at the wrong temperature, humidity or not turned properly, then the ducklings can have serious lifelong health problems such as seizures. As ducks age they can suffer from age related diseases. Older ducks are more likely to suffer from seizures than younger ducks. Poisonous plants, herbicides, pesticides, and fertilizers are just a few of the common toxins that when ingested can cause seizures in ducks. Never have these things in or around your duck’s living area. Head trauma can cause seizures. In some cases the seizures will go away in a few days with treatment and as the swelling goes down. Ducks are attracted to shiny objects, and many will eat what they find. Small items such as hardware pieces or costume jewelry can cause lead poisoning.